MISSISSAUGA, ON, Nov. 16 /CNW/ — Phonetime Inc. (TSX: PHD), a leading global supplier of international long distance telecommunication services, today reported its financial results for the three- and nine-month periods ended September 30, 2009. All figures are in Canadian currency. Consolidated revenue for the third quarter ended September 30, 2009 was $44.4 million, up 13.2% from $39.2 million for third quarter of 2008. For the nine-month period of 2009, Phonetime’s revenue was $128.2 million, an increase of 11% when compared to 2008. The growth is chiefly due to higher sales volumes of the Company’s Wholesale Division, which buys and resells telecommunications long-distance services to telephone carriers around the world using Phonetime’s proprietary call trading platform. Phonetime also generates revenues through its Consumer Division, which provides pre-paid calling cards and long-distance services to targeted ethnic consumer groups across Canada. Phonetime currently has more 130,000 customers using its long-distance retail services. 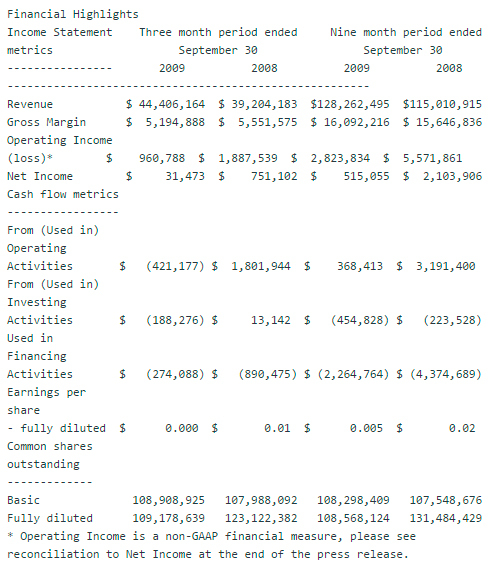 Operating income (a non-GAAP measure) was $683,000 for the three months ended September 30, 2009, down from $913,000 in the prior quarter and down from $1,755,000 in the third quarter of 2008. Revenue has grown quarter over quarter and over the comparative quarter from the prior year. Gross margin has declined to 11.7% in the three month period and 12.5% for the year to date versus 12.5% and 13.6% in the year prior corresponding periods. In absolute terms, the decline in contribution from gross margin was $357,000 in the three month period ended September 30, 2009 but contributed an additional $445,000 for the year to date. In the nine month period, operating costs were $3.2 million higher in 2009 than in the prior year. The increase was split between sales and marketing costs which were higher by $1.9 million and general and administrative costs which were higher by $1.5 million. Operating costs in the three month period increased by $715,000 year over year comprised of compensation and commission costs of $500,000, increased marketing costs of $400,000 and higher general and administrative expenses of $815,000. General administrative costs increased in part due to one-time expenses of $300,000, consisting of an additional $50,000 for the Competition Bureau settlement, $250,000 for financing and investor relations costs, $275,000 related network collocation costs and ongoing office costs related to head count increases including office expansions in Vancouver and Florida of approximately $240,000. Cash flow from operating activities was a net outflow of $422,000 in the three-month period ended September 30, 2009 as compared to a contribution of $1.8 million in the prior year. For the nine-month period ended September 30, 2009, the cash contribution from operating activities was $368,000 as compared to $3.2 million for the same period in 2008. Working Capital deficit was $3.7 million as at September 30, 2009, an improvement from a deficit of $5.4 million as at June 30, 2009 and an improvement from a working capital deficit of $4.6 million at December 31, 2008. Working capital includes $7.7 million of bank and other debt due in the next 12 months, compared to $8.4 million of bank and other debt due as at June 30, 2009 and $7.3 million as at December 31, 2008. The Company has been in breach of its bank loan covenants since December 31, 2008. The bank has tolerated the breach working with Phonetime by amending the credit facility agreement and the covenant ratios therein and by giving management time to source additional financial capital. In July 2009, the Company closed on an equity financing transaction issuing 3,733,332 units for gross proceeds of $560,000 at $0.15 per common share. Certain officers and employees of the Company subscribed for $260,000 of this amount. In the quarter ended September 30, 2009, the Company signed a term sheet for a $5,000,000 subordinated debt issue with a tentative closing on or about August 31, 2009. One of the preconditions of the closing was an acceptable Intercreditor Agreement between the anticipated subordinated lender and the senior lender. The Senior Lender and the anticipated Subordinated debt holder were unable to come to terms on the Intercreditor Agreement which has prohibited the subordinated lender from closing the financing. As a result of the above impasse, the Company has undertaken to seek a replacement to its Senior Lending facility and is also seeking an alternative to the current anticipated Subordinated Lender. The Company expects that it will be able to restructure its debts by the end of the first quarter 2010. There is no certainty that this restructuring can occur or that it can occur on favourable terms. As at September 30 2009, Phonetime held cash and short-term investments of $0.03 million as well as accounts receivable of $14.4 million. $176,667 per month and extending the maturity by twelve months. – The number of Consumer Division customers grew to 130,000.
with the changing business dynamics. Phonetime will host a conference call to discuss its 2009 third quarter financial results on Wednesday, November 18 at 11:00 a.m. (ET). A live audio webcast of the conference call will be available at www.phonetime.com. Please connect at least 15 minutes prior to the conference call to ensure adequate time for any software download that may be required to join the webcast. The webcast will be archived at the above web site for 30 days. Phonetime will file its consolidated financial statements for the third quarter 2009 and related management’s discussion and analysis with securities regulatory authorities within the applicable timelines. The material will be available through SEDAR at www.sedar.com and the Company’s website, www.phonetime.com. Readers are cautioned that non-GAAP measures do not have standardized meanings prescribed by GAAP. Operating income has no standardized meaning prescribed by Canadian GAAP and is considered a non-GAAP measure. Operating income is earnings before misappropriation of funds, stock compensation costs, interest, taxes, depreciation and amortization. This measure may not be comparable to similar measures presented by other issuers. This measure is described and presented herein in order to provide shareholders and potential investors with additional information regarding the Company’s liquidity and ability to generate funds to finance its operations.